easyJet, Europe’s leading airline, has today (20 Jun 2017) announced a step forward in its predictive maintenance programme with Airbus with the launch of the Airbus Skywise platform. The system helps to predict aircraft faults before they occur thereby preventing delays and cancellations for passengers. easyJet and Airbus have been working for two years to identify the airline’s top 100 technical issues and this has resulted in a bespoke platform for easyJet which can help to predict technical issues by allowing engineers to intervene early and replace parts during routine maintenance before the component causes any issues thereby preventing delays. Since October easyJet has been trialing the platform on 85 aircraft in its fleet. During that time we have focused on three specific technical issues which has resulted in removing 14 components before an issue could have occurred. This has meant more than 2000 passenger journeys have operated on schedule that would otherwise have been disrupted – potentially incurring overnight delays. “Over two years our engineers and IT team have been working very closely with Airbus to build the capability to capture the data created by the aircraft systems to try and help minimise and prevent delays. Through this work we have managed to identify the most frequent 100 aircraft faults that cause disruption to our passengers and have been working out how to use the data to detect these faults as they develop. “Punctuality is important to our customers and so we want to do all possible to minimise disruption from technical events. Prognosis systems like the Airbus Skywise platform can really transform the way that we maintain our aircraft. “We are really pleased to have collaborated closely with easyJet over the past two years. easyJet is well known for its innovative approach and our joint predictive maintenance trial has shown very tangible results which will help to further optimise the reliability of easyJet’s fleet. Airbus launched the Skywise aviation data platform at the 2017 Paris Air Show (Le Bourget), in collaboration with Palantir Technologies – pioneers in big-data integration and advanced analytics, and several leading operators. Skywise aims to become the single platform of reference used by all major aviation players to improve their operational performance and business results and to support their own digital transformation. easyJet has been using DataBird on two aircraft with the richest aircraft technical data to support existing hardware, this has been accessed on the underlying platform directly using Quiver to measure the effectiveness of maintenance actions and conduct fleet-wide analysis on aircraft technical and maintenance data. easyJet operates Europe’s largest and the world’s fourth largest Airbus single-aisle fleet – currently operating 272 aircraft. 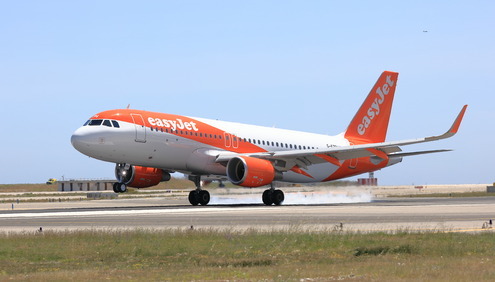 Since easyJet took delivery of its first Airbus aircraft (an A319) in September 2003, Airbus has delivered an aircraft to easyJet on average every 16 days. The airline has 157 aircraft currently on order, and in terms of total aircraft orders is Airbus’ third biggest airline customer. easyJet has a fleet of 272 Airbus aircraft currently. easyJet operates its fleet of aircraft in strict compliance with all manufacturers’ regulations, often exceeding them. The airline employs a highly skilled workforce of more than 200 engineering staff as well as outsourcing to external suppliers in many bases across its network. Innovation is in easyJet’s DNA – from the airline’s launch more than 20 years ago when it changed the way people fly to the present day where easyJet leads the industry in digital, web, engineering and operational innovations to make travel more easy and affordable for passengers. In addition to predictive maintenance, easyJet is currently working on a range from innovations from ‎its AVOID ash detection technology and aircraft inspections by automated drones. This entry was posted in Airlines, Business, Travel, Travel Management, Travelers and tagged Airbus Skywise platform, Carolyn McCall, easyJet, Tom Enders. Bookmark the permalink.